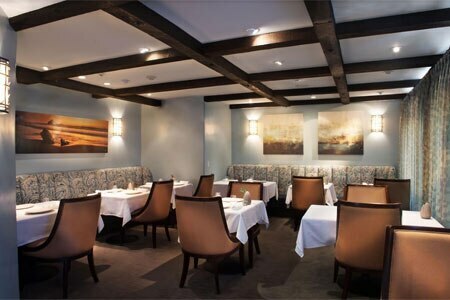 L'Auberge Carmel's intimate restaurant featuring the beautifully executed cuisine of executive chef Justin Cogley. Dinner nightly 6 p.m.-9 p.m.
About the restaurant and décor: This tiny, enchanting restaurant with just nine tables is situated inside L'Auberge Carmel, a luxury inn originally built in 1929. Exposed wood beams bring a cozy feeling to Aubergine’s intimate space. Private parties can be arranged in the underground wine cellar, salon with fireplace or out on the idyllic courtyard. About the food: Executive chef Justin Cogley's creativity with top-tier, seasonal and local products, especially from the sea, leans towards the playful and beautifully executed. Spot-on pairings bring out the best in food and wine --- it's Fred and Ginger dancing on the palate. The chef's eight-course tasting menu ($175 per person) changes frequently and features an enviable grocery list of ingredients (abalone, caviar, foie gras, rib-eye, etc.) for Cogley to prepare according to his whim. The possibilities can be both adventurous and deceptively familiar. There’s an international tour-de-force of cheeses carefully selected from the cave just inside the front door. And dessert? Pastry chef Yulanda Santos might devise a sweet ending composed of smoked chocolate, marshmallow and cocoa. Aubergine also hosts special themed dinners, as well as savory and pastry classes. About the wine: The globally sourced and terroir driven wine list comprises approximately 2,500 bottles, with a spotlight on Monterey County and France . Pairings are available for $145.